SALT LAKE CITY – Utah House Speaker Greg Hughes is a conservative lawmaker who saw public transit as an over-subsidized social service. Given the building costs, he thought the state would be better off buying people cars. While U.S. cities often widen roads when congestion increases, Salt Lake’s options were limited by its mountain ranges and lakes. “That’s where multi-modal begins to makes a lot more sense,” Hughes said. And so his transformation began. Instead of the naysayer, he became a champion for the advancement of Utah’s transportation system, calling on fellow Republican lawmakers to fund highway improvements, along with five new lines of transit. It’s a story that stood out to a group of Nashville business and civic leaders visiting Salt Lake this week. The session was part of a Nashville Area Chamber of Commerce-led trip to study the city’s and region’s approach to city planning issues, with transportation at the core of the mission. Hughes’ tale provided hope that the most rigid local and state minds might be swayed when it came to addressing congestion issues in the region, but also underscored what they were up against in Tennessee. 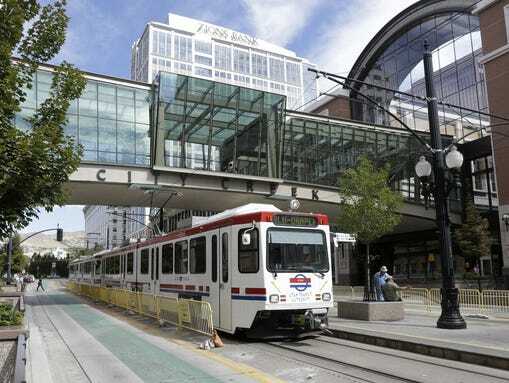 In the Salt Lake area, 140 miles of commuter and light rail lines transport residents throughout the area, along with bus routes, bikeways and sidewalks weaving throughout the city’s core. The transit system alone has cost $3.6 billion since the first, 16-mile line opened in 1999, with funds stemming from local sales taxes and federal grants. Each weekday, students and workers throughout the area pour from the railcars during rush hours, freeing up interstates and roads for drivers. The system also has supported revitalization and development along the light rail lines. More than $6 billion in private investment dollars followed the lines’ construction. 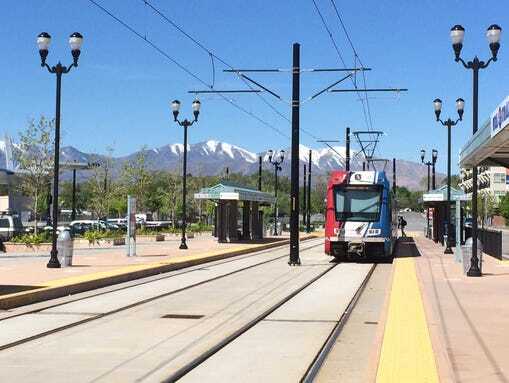 In areas once reserved for parking, $1 billion in new buildings have been developed at the University of Utah, according to Hal Johnson, manager of project development for the Utah Transit Authority. Light rail and road projects have helped attract companies including Adobe and Microsoft to the area, and eBay expanded its Utah operations near a new rail station, said Abby Albrecht, who leads a coalition of Salt Lake business leaders formed to support transportation solutions. A key part of Utah’s transportation success in the legislature in the past decade has been developing a plan on a unified front. Instead of each faction competing for funds for specific projects, they put together a plan addressing transit and road needs. Business and education leaders came together, emphasizing the economic cost of doing nothing. Local voters approved a sales tax in 2006, and the five new lines of transit were built $300 million under budget and two years ahead of projections. Most recently, a unified plan led to a funding package — passed in the final hours of the 2015 legislative session — that addresses an $11 billion shortfall for projects related to roads, transit, bike and pedestrian systems through 2040. The measure reformed the gas tax and allowed local municipalities to hold voter referendums for a quarter-cent sales tax increase. “We got buy-in first on what the needs are, what the challenges are, what investments are needed and then we were able to have a much more productive conversation about funding,” said Andrew Gruber, executive director of the Wasatch Front Regional Council, an association of regional government officials. In Nashville, the sales tax rate is a lofty 9.25 percent, compared to 6.85 percent in Salt Lake. Property taxes are devoted to funding Metro government and schools, and Tennessee voters passed a referendum banning state income taxes last year, underlining the local challenge for funding a large-scale transportation plan. Like Nashville, Salt Lake is a blue city in a red state, but the difference is that 80 percent of Utah’s population lives in the region surrounding Salt Lake, called the Wasatch Front. While persuading lawmakers from rural areas to approve transportation funding was a challenge in Utah, Nashville leaders would have to convince rural factions, but also those from the state’s other three metropolitan areas who may not be keen on funding big ticket projects in Middle Tennessee. Another distinction is the 2002 Olympic Games that was among factors prompting the region’s earliest lines. Light rail was created based on residents’ need, but it was built to be available in time for the Olympics, Johnson said. Once residents recognized the value, they were willing to invest more to support the system’s expansion. Many in the Salt Lake area have a car but choose to take transit instead, even when it tacks on more time. 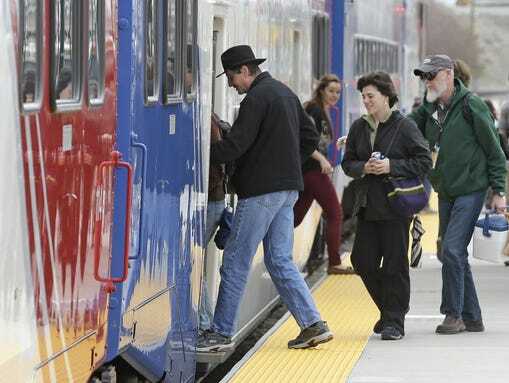 According to Utah Transit Authority’s general manager, two-thirds of transit riders have a car. Speaker Hughes, who drove to the meeting with Nashville leaders, said he prefers driving. While he is not among the 84,000 daily transit riders, he says he still utilizes its benefits. If those riders were on the roads, his day would become much less productive and his fuel costs would be higher. Perhaps most encouraging to those eager to make transportation progress is Utah’s setbacks. In 1992, a referendum on a quarter-cent sales tax to build light rail, improve road and bus services fell short of the needed vote. The region was able to use existing funds and a $241 million federal grant to cover the project, a tactic that residents protested. But when the light rail opened, its usage exceeded projections and voters supported a sales tax increase for expansion in both 2000 and 2006. The dissent prompted by Salt Lake’s initial referendum was a familiar scenario to many of the Nashville chamber members who had championed Mayor Karl Dean’s AMP project, a $174 million bus rapid transit project. Public resistance and opposition from state legislators ultimately led to its collapse last year. Rather than focus on specific projects, transportation leaders should offer broader solutions to road and congestion problems hurting the region, according to the Utah officials. It’s a takeaway that likely will be incorporated in the local leaders’ playbook going forward. The chamber’s preliminary outline, presented by chamber CEO Ralph Schulz at the trip’s conclusion, calls for a completed update to the Metro Transit Authority’s and Regional Transit Authority’s strategic plan within a year and for funding sources to be identified within three years. Community input features prominently, and the chamber has a goal of gathering perspectives from at least 30,000 individuals in the region. By 2020, dirt should begin turning, according to the preliminary draft, conveying the sense of urgency expressed by many of the Nashville travelers. Between 2010 and 2040, Middle Tennessee’s population will grow by 1.3 million. Congestion costs the Nashville area more than $800 million annually in wasted fuel and lost time. The amount of time residents spend in cars is expected to double by 2040. 86 percent of Middle Tennessee residents surveyed said a regional transit system is needed. 61 percent said they would be willing to pay slightly more in some type of tax or fee to support it. What: Cumberland Region Tomorrow is hosting a 2015 Power of Ten Regional Summit for Middle Tennessee leaders in government, economic, development, planning and engineering to focus on transportation issues. When: 1-6 p.m., June 18.
Who: Speakers include Metro Transit Authority CEO Steve Bland, Nashville Area Metro Planning Organization Executive Director Michael Skipper, Tennessee Commissioner of Transportation John Schroer, Nashville Area Chamber of Commerce CEO Ralph Schulz and Franklin Mayor Ken Moore. More: For more information and to register, visit 10Power.org.